On the evening of Sunday, April 21, we mark the beginning of Holy Week, remembering and sharing in our Lord’s journey to the Cross and the Tomb before his resurrection. We will have services each day of Holy Week—you may read a summary of the schedule here. Great and Holy Monday, Tuesday, and Wednesday are dedicated to the Bridegroom: “Behold the Bridegroom comes at midnight, and blessed is the servant whom he shall find watching....” The Bridegroom Matins services are held on the evening before each of these days, and serve to focus our attention on what is to come, reminding us that we need to watch and pray every day of our life, because we do not know the day or the hour when we will meet the Lord. Great and Holy Thursday is devoted to the Mystical Supper. “Mystical” has nothing to do with New Age or magic. “Mystical” literally means “hidden”—so we are celebrating the hidden reality behind the Supper which the Lord celebrated with his disciples before his betrayal, and also the reality behind the Supper that we share in the Divine Liturgy. We can only see bread and wine, but our Lord tells us, “This is my Body broken for you....” Matins of Holy Thursday is observed on Wednesday evening, and we celebrate Vespers and Liturgy on Thursday morning. 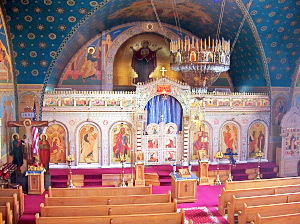 At this Liturgy, not only do we remember how our Lord first told us to “do this in remembrance of me,” but also we consecrate and prepare the Reserved Sacrament, which is kept in the Tabernacle on the Altar throughout the year, to distribute to the ill and shut-ins who cannot come to church. Great and Holy Friday begins the Three-Day Passion. On Thursday evening, we celebrate Matins with twelve Gospel readings, taking us from the Last Supper to the garden where our Lord spent the night in suffering prayer, from his betrayal to his unjust trial to his crucifixion and death. It is solemn, awe-inspiring, and the absolute center of our faith. It is also long and demanding on soul and body—be prepared! The next morning we have Royal Hours of Holy Friday, a time for quiet reflection on the Lord’s crucifixion. It is much simpler than Matins, but also beautiful. Especially if a long evening service is a challenge for you, consider making Royal Hours a focal point in your week. With Vespers at 3:30 PM on Holy Friday, we make a transition to the Tomb of our Lord. By now, the Tomb is set in the middle of the church and decorated with flowers. The Shroud of the Lord is brought out for veneration at this service. Great and Holy Saturday is devoted to the mystery at the heart of our salvation: the day our Lord lay dead in the Tomb. It seemed an utter defeat, but actually it was the moment of everlasting victory: our Lord descended into Hades, the realm of the dead, broke down its gates and brought out all its prisoners. When the Lord seemed most helpless, he was actually most active. So with Matins on Friday evening, we hear words mixing sorrow and joy. The entirety of Psalm 118/119 is chanted (the same one quoted at the funeral service: “Blessed are you, O Lord, teach me your statutes!”), interspersed with hymns meditating on the meaning of the Cross, the Tomb, and the Resurrection. We also carry the Shroud in procession around the Church, like in a funeral procession. Vespers and Liturgy of Holy Saturday quietly marks the first celebration of the Resurrection. We hear 15 readings from the Old Testament, all showing how it was necessary for our Lord to suffer and die, to rise again on the third day. At the end of them, we change all the dark coverings and vestments to our brightest white and hear the first Gospel reading of the Resurrection, with the command from our Lord: “Go therefore and make disciples of all the nations, baptizing them in the name of the Father and of the Son and of the Holy Spirit, teaching them to observe all things that I have commanded you; and lo, I am with you always, even to the end of the age” (Matt. 28:18). 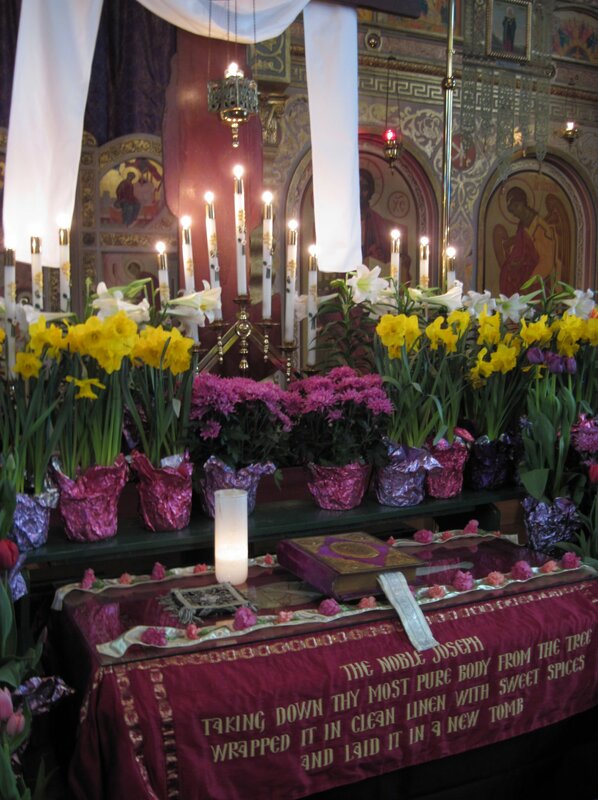 We still await the full day of Pascha to begin! We gather again before the Tomb in almost complete darkness Saturday night, and hear some of the same hymns from Matins of Holy Saturday. At their end, the Shroud is taken up and placed on the Altar, where it remains in honor until the Paschal Season ends. Then all candles are put out, and a fresh light is lit while the priest begins the hymn, “Your Resurrection, O Christ our Savior, the angels in heaven sing. Enable us on earth to glorify you in purity of heart!” After three times, the Royal Doors open, everyone’s candle is lit from that original flame, and we go out in procession, singing the same hymn. Pascha is far too big a feast to fit into just one night, so we pry our eyelids open and gather again for Paschal Vespers at noon on Sunday, which is short and sweet and bubbling with joy. 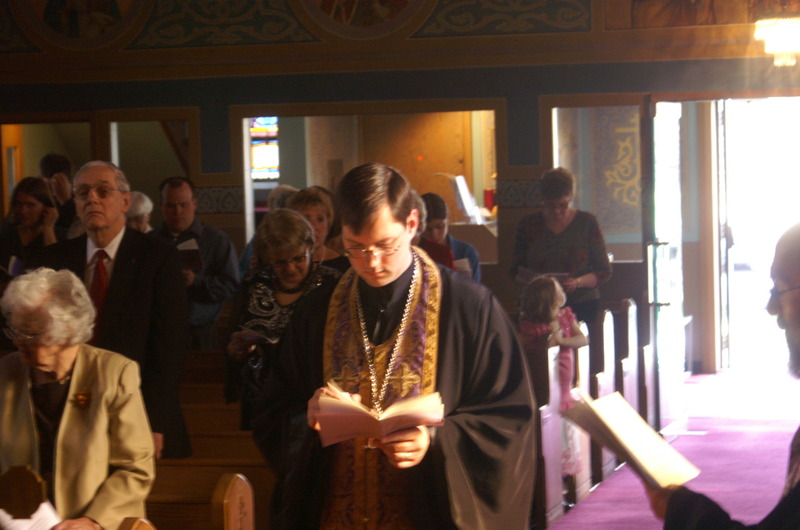 The joy overflows into Bright Week, which we observe with Divine Liturgy on Bright Monday. We hear some of the same hymns from the Paschal Vigil, but we also have a special procession, stopping at the four sides of the church to hear four Gospel accounts of the Resurrection. Both of these services are very accessible to children.